Dr. Albin in the NY Post on Anxiety. Specific Phobias are a form of anxiety disorders. Phobias can develop from various triggers including a past trauma, stressful situation, hyperventilation problems or anxiety that over-generalizes . Panic attacks and fear of the discomfort that becomes associated with certain environments drives avoidance . Research has established that overcoming a phobia requires exposure therapy. This type of behavior therapy provides opportunity for the brain and associated features of emotions and physical symptoms to relearn that these situations are “safe”. How the exposure therapy is accomplished can have significant meaning in curing a phobia. For example if you don’t expose your self in a safe and prolonged enough manner the treatment can make you want to escape and create a strengthening of the fear. This is something you don’t want. In our virtual reality treatment of phobias and anxiety we deliver the exposure to the patient in controlled and prolonged manner so that the patient can build mastery of coping skills, become desensitized to the phobic event and learn to stay calm. We combine the virtual reality experience with biofeedback to help regulate and control the patients physical arousal and again build mastery of their body and brains’ functioning. The combination of the prolonged exposure therapy of the virtual reality and biofeedback allows for the patients’ fear to become less capturing and allows for the patient to reintegrate new core beliefs such as “I am safe. I can breathe. I can be present”. Have you tried this type of treatment in the past but it did not feel comfortable or real enough? Well Our office just signed up to be a part of the new expert network for www.psious.com which uses the new galaxy goggles and the lastest technology from a smart phone to deliver the best visual virtual environments of planes, elevators, bridges, social and public speaking events and more. This protocol of virtual reality therapy also delivers relaxation training through visual systems that teach you how to control your breath and take advantage of the feature of the visual cortex. 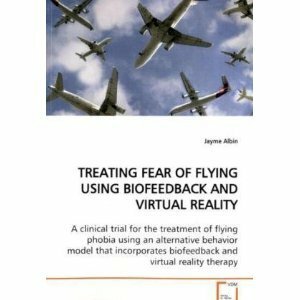 Dr. Albin is an expert in the treatment of Phobias using virtual reality and biofeedback. She has published a clinical book based on her research and presented at the International Fear of Flying Conference.